Gratis NOLA! 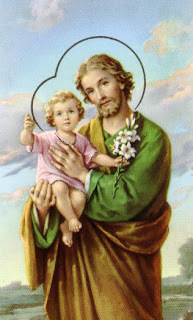 : Happy St. Joseph's Day! March 19th marks the Catholic celebration of St. Joseph's Day where Catholic New Orleanians construct elaborate altars in honor of this saint. The tradition, commemorating the relief St. Joseph provided during a famine in Sicily, began in the late 1800’s when Sicilian immigrants settled in New Orleans. Today, St. Joseph’s day is not just for Italian-Americans. Every year, this celebration offers New Orleans natives and visitors a chance to share food with others and for believers, a way to express gratitude for any sort of fortune in their lives. Stop by and celebrate one of the most unique New Orleans traditions - here's a list of some of the altars around town today! and, in Houma, 5818 W. Main St. The Rouse family grew up going to altars in Thibodaux and coming to New Orleans to see them. ST. LOUIS CATHEDRAL (held at St. Mary's Church/Old Ursuline Convent, 1116 Chartres St.): March 19, Blessing by Archbishop Gregory M. Aymond at 8:30 a.m., with public viewing from 8:30 a.m. to 3 p.m. Meals will be served beginning at noon. ARCHBISHOP CHAPELLE HIGH SCHOOL, 8800 Veterans Memorial Blvd., Metairie (gymnasium): March 18, blessing by chaplain Deacon Drea Capaci. Public viewing March 18, noon to 8 p.m., closing with rosary. March 19, viewing from 9 a.m. to 3 p.m., with 2:30 p.m. prayer service before altar broken. Students will tour altar from 11 a.m. to 1 p.m. BLESSED FRANCIS SEELOS CHURCH, 3053 Dauphine St., New Orleans (Parish Hall): March 18, viewing 9 a.m.-5 p.m.; March 19, viewing 9 a.m.-4 p.m. Blessing at noon followed by serving of meals. BROTHER MARTIN HIGH SCHOOL (James B. Branton Chapel), 4401 Elysian Fields Ave., New Orleans: Sponsored by Campus Ministry assisted by Brother Martin Builders Club students, March 19, 7:20 a.m. Mass, with blessing at 8 a.m. followed by public viewing until 7 p.m. Spaghetti dinner served in the Tom and Gayle Benson Mall from 4-7 p.m. Special feature is a tapestry of St. Joseph and the Christ Child, purchased in Rome by the Brothers' Generalate and donated to the New Orleans Brothers for the altar. This year's altar in memory of Sacred Heart Brother Jean Sobert and long-time faculty member Ricky Nuesslein. CHRIST THE KING SCHOOL, 2106 Deerfield Rd., Terrytown: March 19, blessing at 10 a.m. with viewing until 2 p.m.
DE LA SALLE HIGH SCHOOL, 5300 St. Charles Ave. (school lobby), New Orleans: March 19, viewing 9 a.m.-4 p.m. Blessing at 9:15 a.m. "Tupa, Tupa" Holy Family playlet, rosary at 11:30 a.m. St. Joseph is the patron saint of the Brothers of the Christian Schools (Christian Brothers). DIVINE MERCY PARISH, (held at St. Elizabeth Ann Seton Church, 4119 St. Elizabeth Drive, Kenner): St. Elizabeth Ann Seton fourth-grade students and various Divine Mercy ministries and parishioners sponsor. Public viewing March 16 blessing after 8 a.m. Mass, then open till 5:30 p.m. (after 4 p.m. Mass); March 17, viewing after the 8 a.m., 10 a.m. and 6 p.m. Masses. March 18-19, viewing after the Mission Mass at 9:30 a.m. until mission concludes each evening. Altar will be broken March 20 after the 9:30 a.m. Mission Mass. GOOD SHEPHERD PARISH (St. Stephen Church, 1025 Napoleon Ave., New Orleans): Public viewing March 19, with blessing during the 8:30 a.m. St. Joseph Mass. Viewing from 11:30 a.m. to 6:30 p.m.
HOLY CROSS SCHOOL, 5500 Paris Ave., New Orleans (Holy Cross Library, 3rd floor, Administration building): March 19, viewing from 10 a.m.-2 p.m., with blessing after 9 a.m. Mass. HOLY FAMILY CHURCH, 1220 14th Ave., Franklinton (church hall): March 19, Mass at 10 a.m. in church, followed by altar blessing, serving of the Saints. Public viewing and meals from 11 a.m. to 1:30 p.m.
HOLY NAME OF JESUS SCHOOL, 6325 Cromwell Place, New Orleans (Cromwell Place entrance): March 19, public viewing from 9 a.m. to 2 p.m., with blessing at 10 a.m.
IMMACULATE CONCEPTION (JESUIT) CHURCH, 130 Baronne St., New Orleans (Lenes Hall): March 18, viewing 8:30 a.m.-5 p.m.; March 19, viewing 8:30 a.m.-4:30 p.m., with blessing at the conclusion of the noon Mass in Lenes Hall, where meals will be served. MOUNT CARMEL ACADEMY, 7027 Milne Blvd., New Orleans (enter at marked gate): Sponsored by Mount Carmel Academy March 19. Blessing at 7:30 a.m., followed by viewing until 6 p.m. Parking available on Milne Blvd. OUR LADY OF GUADALUPE, St. Jude Hall, 400 Basin St., New Orleans: March 19, blessing at 7:30 a.m. with viewing until noon. Meals served at noon. OUR LADY OF PERPETUAL HELP, 1908 Short St., Kenner (Larose Center): March 16, altar opens with blessing at 3 p.m. and viewing until 6 p.m. March 17, viewing from 9 a.m.-7 p.m. March 18, viewing 9 a.m.-8 p.m. March 19, 9 a.m.-8 p.m., with celebration of the Saints at noon, then meals served until food runs out. March 20, cookies will be available at 3 p.m. in the Larose Center. OUR LADY OF PROMPT SUCCOR, 531 Avenue A, Westwego: March 19, blessing at 10 a.m. Public viewing from 11 a.m. till. OZANAM INN, 843 Camp St., New Orleans: Sponsored by St. Patrick Church. March 18-19, with viewing from 9 a.m. to 6 p.m. daily, with blessing March 19 at 9 a.m. Visitors will receive traditional St. Joseph bags, and blessed St. Joseph candles will be available. All food on the altar will be given to Ozanam Inn to be distributed to the needy they serve. All monetary donations will also be given to the Inn. POPE JOHN PAUL II HIGH SCHOOL, 1901 Jaguar Dr., Slidell: March 19, viewing 9 a.m.-12:15 p.m., with blessing during 10:30 a.m. Mass. SACRED HEART, 28088 Main St., Lacombe: March 18, viewing 11 a.m.-4 p.m. March 19, viewing begins at 9 a.m. with blessing at 4 p.m. followed by serving of meals at 4:30 p.m.
ST. ALPHONSUS, (St. Mary's Assumption Church, 923 Josephine St., corner Constance, New Orleans): March 18, blessing at 3 p.m. March 19, open for public viewing from 9 a.m. until altar broken noon. ST. AUGUSTINE CHURCH, 1210 Gov. Nicholls St., New Orleans: March 19, public viewing from 11 a.m. till with blessing at noon, followed by meals until run out. ST. BENILDE, 1901 Division St., Metairie: All visitors must enter and check in at the school office before viewing the altar on March 19. Blessing at 8 a.m., with viewing from 9 a.m.-6 p.m. in school cafeteria. Holy cards and lucky beans given and holy candles available for a $3 donation. ST. CLEMENT OF ROME CHURCH, 3978 W. Esplanade Ave., Metairie: First graders sponsor and build in school cafeteria. Public viewing March 19, 10:30 a.m.- 1 p.m. with blessing by Father Peter Finney III at 10 a.m. after the school Mass. ST. CLETUS CHURCH, 3600 Claire Ave., Gretna (Jerome Hall): March 18, 6 p.m. rosary and blessing, open for viewing until 8 p.m. March 19, viewing 11 a.m.- 7:30 p.m. with food served until it runs out. ST. DOMINIC CHURCH, 775 Harrison Ave., New Orleans: St. Dominic Rosary Altar Society hosting. Open to the public March 17-19 from 8 a.m.-6 p.m.
ST. FRANCIS XAVIER, 444 Metairie Rd., Metairie: St. Joseph Altar Committee sponsors. Viewing March 18, 9 a.m.-7 p.m.; March 19, 8 a.m. Mass, followed by formal adult "Tupa Tupa" and public viewing until 6 p.m. candle rosary. Traditional pasta Milanese meals March in school auditorium from 11:30 a.m. until food runs out. ST. FRANCIS OF ASSISI, New Orleans: Altar at the home of Joseph and Mary Talamo, 6122 Patton St. March 18, blessing at 6 p.m. with public viewing until 7 p.m. March 19, viewing from 1-5:30 p.m.
ST. JANE DE CHANTAL, 72040 Maple St., Abita Springs (St. Jane Hall): Sponsored by St. Joseph Guild March 19, with blessing and viewing after 11 a.m. Mass (in Italian by Father Jeffrey Jambon) followed by procession to St. Jane Hall. Saints served at noon, followed by the public at 12:30 p.m. until food runs out. ST. JOAN OF ARC, 529 W. 5th St., LaPlace: Blessing in Family Life Center March 18 at 6 p.m., with viewing until 8 p.m. March 19, public viewing from 8 a.m.-8 p.m. Cookies will be distributed and donation accepted. ST. JOHN THE BAPTIST, 11345 St. John Church Rd., Folsom: March 19, Benedictine Father Timothy Burnett, will bless the altar at 8:30 a.m., with viewing until 11 a.m. in Jonathan Hall. Mass of St. Joseph at 11 a.m., then visitors served until 1:30 p.m. Italian cookies, St. Joseph medal and fava bean to devotees. ST. JOSEPH, 610 Sixth St., Gretna: Altar located in gym at 7th and Newton streets. Sponsored by church, prepared by St. Joseph Women's Club. March 18, 6 p.m. candlelight procession followed by 6:30 p.m. Mass, viewing to 7:30 p.m. March 19, solemn 10 a.m. Mass, procession and altar blessing, with meals being served from noon-6 p.m.
ST. JOSEPH CHURCH, 1802 Tulane Ave., New Orleans: March 19, viewing 9 a.m.-7 p.m. in the church, with Mass and blessing at noon. Meals served beginning at 1 p.m.
ST. LUKE THE EVANGELIST, 910 Cross Gates Blvd., Slidell: Viewing in the Family Life Center March 18 from 4-6 p.m. March 19, procession after Mass at 10 a.m. to Family Life Center for blessing and serving meals until 2 p.m.
ST. PATRICK, 28698 Highway 23, Port Sulphur (Family Life Center): March 17, viewing 11 a.m.-1 p.m.
ST. PETER CATHOLIC SCHOOL, 130 E. Temperance St., Covington (St. Mary's Hall): Hosted by Grandparents' Club, with public viewing after all weekend Masses March 16-17 and after 8:30 a.m. Masses on March 18 and March 19. Altar blessing on St. Joseph's Day, March 19, at 9 a.m. School children will view March 18-19. Blessed food available for takeout until it runs out. ST. RITA PARISH AND SCHOOL, 7100 Jefferson Hwy., Harahan (Msgr. Champagne Community Room): March 18-19, sponsored by St. Rita Grandparents' Club and parishioners. Public viewing March 18, 4-6:30 p.m.; March 19, 9 a.m.-6:30 p.m., with blessing at 9 a.m. and meals served from 11 a.m.-1:30 p.m., then again from 5-6:30 p.m.
STS. PETER AND PAUL, 66192 St. Mary St., Pearl River: Public invited to March 18 Mass at 6:30 p.m., with viewing until 8:30 p.m. March 19, blessing at 11 a.m. with viewing until 5 p.m. Meals served. ST. FRANCIS VILLA, 10411 Jefferson Hwy., River Ridge: Altar prepared by residents of the assisted living community. Viewing March 19, 10 a.m.-4 p.m.; blessing 10:30 a.m. with children reenacting Holy Family. Meals will be served from 2-4 p.m. Keepsake bags with fava bean, cookies, prayer card will be distributed. Altar bounty will benefit Ozanam Inn. WYNHOVEN HEALTHCARE CENTER, 1050 Medical Center Blvd., Marrero: March 19, public viewing 10 a.m.-2 p.m. To offer donations, please call Sister of St. Joseph Teresa Pitruzzello at (504) 347-0777. XAVIER UNIVERSITY OF LOUISIANA, 1 Drexel Dr., New Orleans (Administration Building Chapel - Bldg. 1): March 19, viewing from 8 a.m.-5 p.m. Altar will be broken at 5 p.m. (see campus map: http://www.xula.edu/about-xavier/campusmap.php).